The tire pressure monitoring system is NOT a substitute for manually checking tire pressure. The tire pressure should be checked periodically (at least monthly) using a tire gauge. See Inflating Your Tires in this chapter. Failure to properly maintain your tire pressure could increase the risk of tire failure, loss of control, vehicle rollover and personal injury. 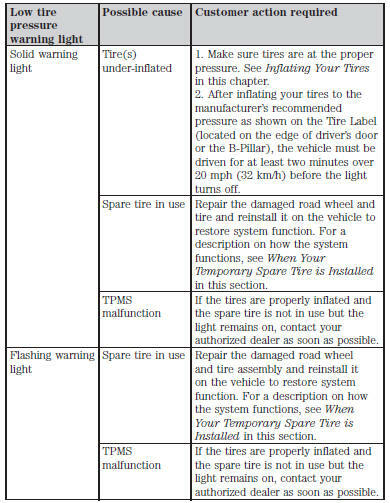 provided), should be checked monthly when cold and inflated to the inflation pressure recommended by the vehicle manufacturer on the vehicle placard or tire inflation pressure label. (If your vehicle has tires of a different size than the size indicated on the vehicle placard or tire inflation pressure label, you should determine the proper tire inflation pressure for those tires.) As an added safety feature, your vehicle has been equipped with a tire pressure monitoring system (TPMS) that illuminates a low tire pressure telltale when one or more of your tires is significantly under-inflated. Accordingly, when the low tire pressure telltale illuminates, you should stop and check your tires as soon as possible, and inflate them to the proper pressure. Driving on a significantly under-inflated tire causes the tire to overheat and can lead to tire failure. Under-inflation also reduces fuel efficiency and tire tread life, and may affect the vehicle’s handling and stopping ability. Your vehicle has also been equipped with a TPMS malfunction indicator to indicate when the system is not operating properly. The TPMS malfunction indicator is combined with the low tire pressure telltale. When the system detects a malfunction, the telltale will flash for approximately one minute and then remain continuously illuminated. When the malfunction indicator is illuminated, the system may not be able to detect or signal low tire pressure as intended. TPMS malfunctions may occur for a variety of reasons, including the installation of replacement or alternate tires or wheels on the vehicle that prevent the TPMS from functioning properly. Always check the TPMS malfunction telltale after replacing one or more tires or wheels on your vehicle to ensure that the replacement or alternate tires and wheels allow the TPMS to continue to function properly. The tire pressure monitoring system complies with part 15 of the FCC rules and with RSS-210 of Industry Canada. Operation is subject to the following two conditions: (1) This device may not cause harmful interference, and (2) This device must accept any interference received, including interference that may cause undesired operation. Note: Each road tire is equipped with a tire pressure sensor located inside the tire and wheel assembly cavity. The pressure sensor is attached to the valve stem. The pressure sensor is covered by the tire and is not visible unless the tire is removed. Take care when changing the tire to avoid damaging the sensor. You should always have your tires serviced by an authorized dealer. Check the tire pressure periodically (at least monthly) using an accurate tire gauge. See Inflating Your Tires in this chapter. The tire pressure monitoring system measures pressure in your four road tires and sends the tire pressure readings to your vehicle. The low tire pressure warning light will turn on if the tire pressure is significantly low. Once the light is illuminated, your tires are under-inflated and need to be inflated to the manufacturer’s recommended tire pressure. Even if the light turns on and a short time later turns off, your tire pressure still needs to be checked. When one of your road tires needs to be replaced with the temporary spare, the system will continue to identify an issue to remind you that the damaged road wheel and tire assembly needs to be repaired and put back on your vehicle. To restore the full function of the tire pressure monitoring system, have the damaged road wheel and tire assembly repaired and remounted on your vehicle. When putting air into your tires (such as at a gas station or in your garage), the tire pressure monitoring system may not respond immediately to the air added to your tires. It may take up to two minutes of driving over 20 mph (32 km/h) for the light to turn off after you have filled your tires to the recommended inflation pressure. The tire pressure monitoring system monitors tire pressure in each pneumatic tire. While driving in a normal manner, a typical passenger tire inflation pressure may increase about 2 to 4 psi (14 to 28 kPa) from a cold start situation. If the vehicle is stationary overnight with the outside temperature significantly lower than the daytime temperature, the tire pressure may decrease approximately 3 psi (21 kPa) for a drop of 30°F (17°C) in ambient temperature. This lower pressure value may be detected by the tire pressure monitoring system as being significantly lower than the recommended inflation pressure and activate the system warning light for low tire pressure. If the low tire pressure warning light is on, visually check each tire to verify that no tire is flat. If one or more tires are flat, repair as necessary. Check the air pressure in the road tires. If any tire is under-inflated, carefully drive the vehicle to the nearest location where air can be added to the tires. Inflate all the tires to the recommended inflation pressure.